Full mobility without exhaust emissions and cables. 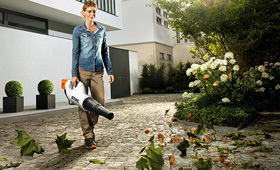 For those that don't want to annoy their neighbours, STIHL offers high performing battery blowers. Mobile, quiet, powerful and just right for use in noise-sensitive areas such as schools, community gardens and hospitals. With a powerful lithium-ion battery and high torque EC motor, they clean up with a push of a button.